We give a lot of presentations around the world. And, without a doubt, the things that always generate the most interest are the cool little things that often aren't very material to the business. Climbing walls, wave machines, shoe vending machines...people love them. This time, we have some random cool techy things to talk about with some wonderful juxtaposition of activities in Europe vs. the U.S.
Let's start with checkouts. Getting out of a store is probably the customers' number one pet peeve and the number one labor cost center for a store. And for decades, retailers have been trying to figure out a solution to both. Over twenty years ago, we saw the first self-serve checkouts at a Kroger store in Atlanta. Awkward and unwieldy at first, this technology eventually has become commonplace in many retailers, accounting for well over 25% of transactions. So, what's next? At the Kroger store in Hebron, Kentucky, you can see one approach. Their experimental Advantage checkout is a futuristic, high speed scanning belt that automatically scans products vs. the one at a time self-scan version. It looks a bit like an airport xray machine. Today, it is clearly early--there's more labor associated with running the experiment than the simple old-fashioned way. And, scan accuracy still has a way to go and exceptions remain a challenge. However, fast forward five years and this could be an enormous time and labor saver. Another way to go about this is handheld scanning in aisle, which has been around for nearly ten years, indicative of how long the technology learning curve can be. However, in the new Carrefour Planet prototype in Lyon, they have made a big press in driving checkout innovation. For Carrefour, scan 'lib is an ambitious effort, supported in multiple areas in the store. As opposed to what we have seen in the US, the marketing and visual presence is a major difference and the "take" rate seems high. Sticking with supermarkets, let's take the checkout process one step further. What if you didn't have to go in the store at all. Two retailers are experimenting with forms of curbside pick-up. Publix has two test locations and we saw one in Tampa. Simple enough in proposition, the customer pulls up into a designated parking space and communicates with the staff who brings their order to the car. There is some in-store marketing associated with the process but it is still relatively low key. At a minimum, it eases the process of in-store pick-up. Taking this to another level is Auchan, which has two different offers in the market. One is ChronoDrive, a standalone effort that offers drive up pick-up service directly at a dedicated warehouse location. They also have AuchanDrive, which is located next to existing Auchan stores. It takes the effort further with dedicated drive up and a pick up session. There's a bit more technology involved where the customer types in a pin code that signals the staff. They claim several hundred customers per day, which is quite impressive. OK, we admit to being vending junkies. And, the more bizarre, the better. There are some amazing vending options in Japan and some pretty cool ones cropping up in Europe. From the scratch baked pizza vending option in Italy to a fresh baked baguette in France, vending is certainly getting more ambitious. In the Monoprix store in Paris, 1 Euro gets you a fresh baked baguette, fully cooked in 60 seconds! The bread, by the way, isn't bad--hot, fresh and stayed soft for the day. The fact that it was sitting in front of a bakery didn't make much sense--it would seem to have more play where you can't get fresh bread. Finally, pop-up hasn't gone away and we are moving fully into pop-up season. One cool marketing effort comes from Target (of course). 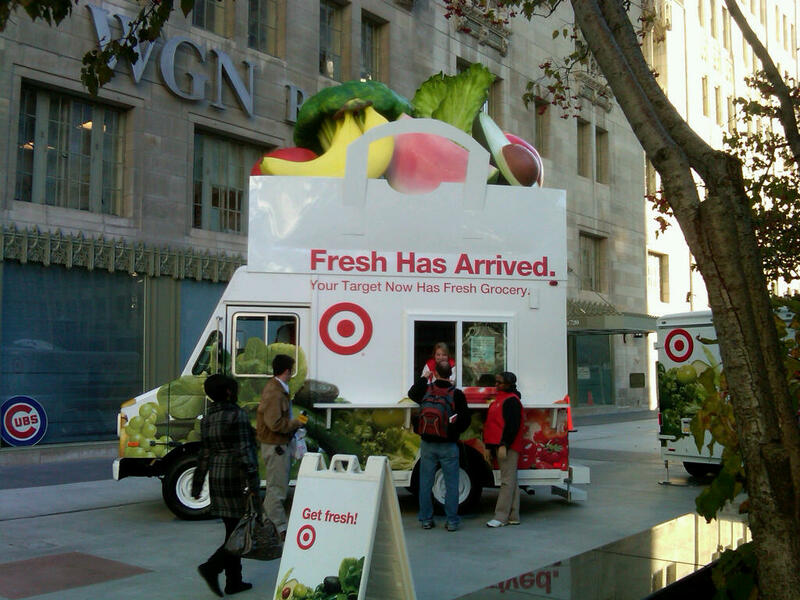 Promoting their revamped P Fresh stores in Chicago, they created a pop-up marketing effort on Michigan Avenue, giving away bags of groceries to promote the extended offer, in conjunction with a lot of other media efforts (billboards, mobile trucks, newspaper) through the city. Cool ideas for sure. Transformative, perhaps. Great speech material? Absolutely. Nice Blog. There are various advantages of using banner stands to display the image of the company or brand as it is the most effective display tool.